What is an uzip file and how do I open an uzip file? UZIP is a compressed disk image created by mkuzip, a FreeBSD compression utility. It compresses a disk image so that it can be read during runtime, and is used to reduce the disk image file size at the expense of additional CPU time when reading the image. UZIP is a small yet powerful extractor for ZIP, RAR, 7z, ISO and several other archive formats. UZIP files can be extracted using other extract programs such as WinZip. HOW TO OPEN A .UZIP FILE? Launch a .uzip file, or any other file on your PC, by double-clicking it. 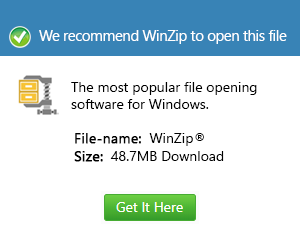 If your file associations are set up correctly, an application such as WinZip will open your .uzip file. It's possible you may need to download or purchase WinZip or another application. It's also possible that you have the correct software, such as WinZip installed on your PC, but .uzip files aren't yet associated with it. In this case, when you try to open a .uzip file, you can instruct Windows which application is the correct one for that file. From then on, opening a  .uzip file will open the correct application.